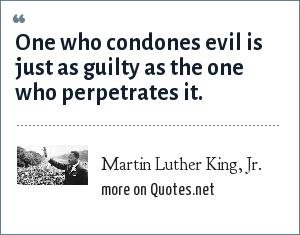 Martin Luther King, Jr.: One who condones evil is just as guilty as the one who perpetrates it. "Martin Luther King, Jr. Quotes." Quotes.net. STANDS4 LLC, 2019. Web. 23 Apr. 2019. <https://www.quotes.net/quote/2556>.